Air Force is also an increase for all service members. Tricare for Airmen is Tricare for all. Are we only fighting for the Air Force? Again, no; we advocate for the enlisted members of all the services. presented to the membership in August. Force Enlisted Corps (active, retired and/or veterans). · We want to lead change in this environment. advocacy organization. We will be the Voice! want to get ahead of the change so we are not left behind. ​ large pool of veterans and families). · Expand our influence with the representation of multiple services. Q: What effect would granting full membership rights to our brothers and sisters of others services have in regards to our IRS status? A: The IRS does not require our membership to be solely Air Force or enlisted. As a veteran service organization, we are required by the IRS to maintain at least 75% of our membership to be active, retired and/or veterans. 22.5% can be family members of active, retired and/or veterans. 2.5% does not have to have any affiliation – just a willingness to support the organization. Q: The new idea about creating an all service association is a GREAT one and will enable us to have a huge voice on the Hill. We look forward to standing side-by-side with fellow Airmen, Marines, Soldiers, Sailors and Coasties to ensure our enlisted voice is heard! Where can I find materials to help share the news of this amazing expansion opportunity? Q: Has our Executive Council approved this change? Q: Why change the name? A: The name change from Air Force Sergeants Association (AFSA) to the Armed Forces Servicemember Association (AFSA) would reflect your associations efforts to recruit, retain and serve the Total Enlisted Corps and their Families. We are still AFSA, still serving our military members and families with pride since 1961 with an unyielding commitment to excellence. 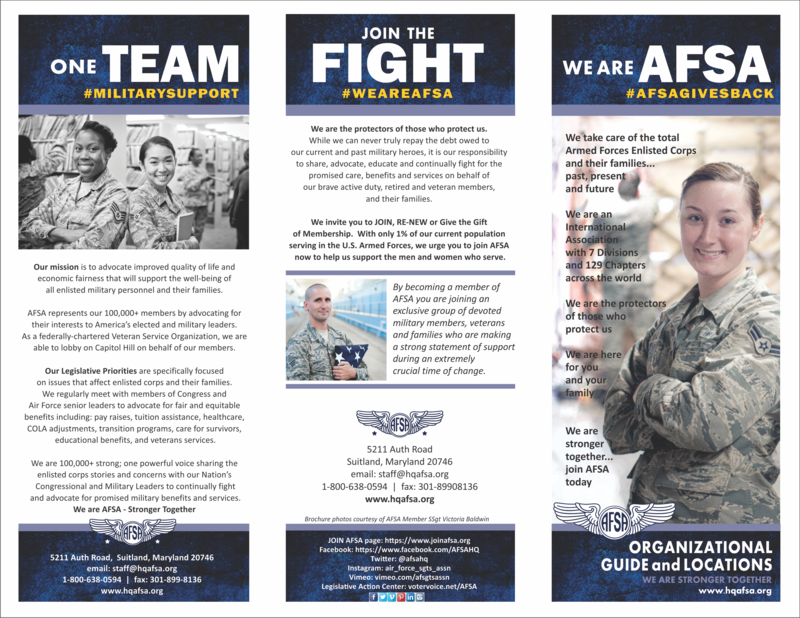 In keeping AFSA, we ensure that we preserve the proud history of our association. However, AFSA will always be AFSA. Q: Are new membership cards going to be issued to current members which includes life members. A. If/when these bylaw changes are approved, any item with the AFSA crest (or spelled out Air Force Sergeants Association) will be replaced with the AFSA Winged logo. This includes membership cards for our life members, desktop flags, decals, etc. Many of these items will be available on our AFSA Chevrons storefront. Q: What about our non-profit status being transferred, incorporation status completed in DC, change of BOD and directors from USAF to mixed services, updated by-laws available. Q: If the name gets changed, will this be a financial burden on all AFSA chapters because of needing a new AFSA flag with the new name as well as fliers, posters, business cards etc. I don’t like the idea of changing everything. A: When any company or non-profit updates their image/branding, everyone must unite to provide a credible and consistent image across all forms of communications. As far as a financial burden, imagine if you will, the impact we can have as far as enrollment and membership when we are able to work together with all branches of the military's enlisted corps. Imagine, the possible strength, fellowship, fraternity and yes, revenue that all Chapters and Divisions could enjoy when we open our association to ALL enlisted members and their families. Chapters and Divisions could quadruple in size and support. We truly understand that many people fear change, but we know that AFSA has a rock solid foundation of devoted leaders and members who are excited about the possibility to serve ALL Enlisted members. With only 1% of the population currently serving in the Armed Forces, and 81.3% of today's Congressional Leaders never having served -- NOW is the time that we must all come together to unite and fight for our promised benefits and services -- as we are truly stronger together. Is it better to stay the course, when the overall national pool for military membership recruiting is dwindling (1%), or take this opportunity to "Join Forces" to ensure our Association is viable for another 55 years -- and more? Q: What effect would granting full membership rights to our brothers and sisters of other services have on our chapters? A: Greater possibilities! 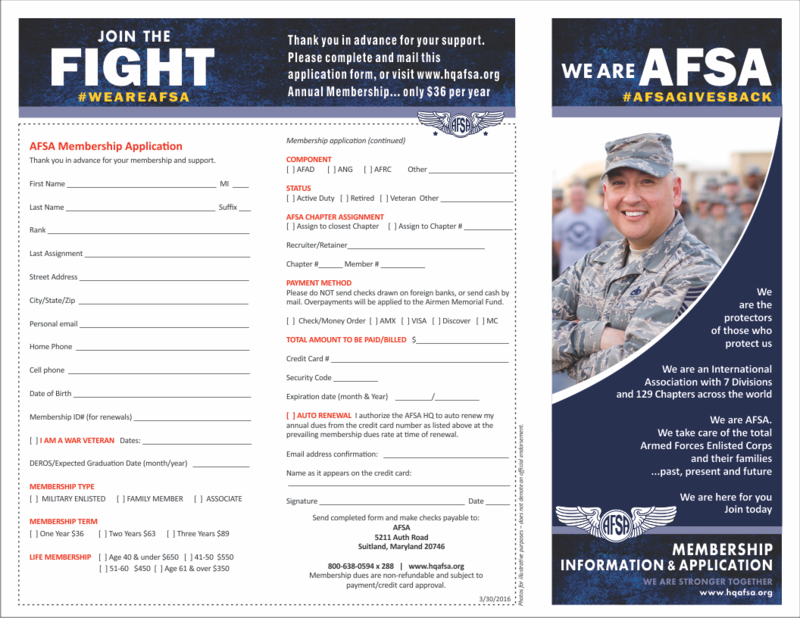 Currently AFSA policy requires 25 interested members to activate, reactivate, or reorganize a chapter. This would be extremely helpful at joint basing locations. ​In addition, AFSA policy currently allows for satellite chapters. A satellite chapter will be subordinate to a fully-chartered AFSA Chapter. The Division President/Executive Council will determine what permanent chapter within their division will be the sponsor for the satellite chapter’s activity. A satellite chapter will conduct AFSA business on behalf of the parent chapter and shall be managed IAW the Association’s Bylaws, Policies and Procedures, and other manuals. All satellite chapter officers must be AFSA members in good standing. The satellite chapter will be led by a locally elected President, Vice President, and three Trustees. The executive council will be assigned to the installation as either permanent party or forward deployed temporary duty members. Q: What effect would granting full membership rights to our brothers and sisters of others services without a name change? A: Many members of the EC have spoken with leaders of our other services. They all said that what we do is important but they would not support the org as Air Force... Yet they would encourage participation as the Armed Forces.